she was the first to offer patients with customized high definition digital lens technology in progressive and single vision. Dr. Kolia has always been on the cutting edge of technology and is proud to announce the introduction of Astoria Sports EDGE in her practice. 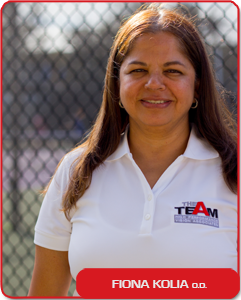 She has attended extensive courses in Visual Neuro Cognitive and Motor Skills Training and is poised to bring world class high performance vision training to athletes in her area.